When working with SQL Trace, one of my biggest frustrations has been the limitations that exist in filtering. Using sp_trace_setfilter to establish the filter criteria is a non-trivial task, and it falls short of being able to deliver complex filtering that is sometimes needed to simplify analysis. Filtering of trace data was performed globally and applied to the trace affecting all of the events being collected. Extended Events introduces a much better system of filtering using Predicates that are applied at the individual Event level, allow for short circuiting of evaluation, and provide the ability to create complex groups of independent criteria, ensuring only Events of interest are captured by the Event Session. In yesterdays post, The system_health Session, I talked about the default system_health session that is running on every SQL Server 2008/2008R2 and Denali CTP1 instance out of the box. The Predicate definition for the sqlos.wait_info event in the system_health session is a good example to follow for complex, short-circuiting Predicate definition in Extended Events. -- that have exceeded 15 seconds. (duration > 30000        -- Waits for locks that have exceeded 30 secs. Since Predicates perform short-circuit evaluation, where the criteria groups are evaluated in order and the first failure in the criteria causes the Predicate evaluation to stop and preventing the Event from being fired in the engine, the order of the criteria can directly impact the performance of an Event Session. If we look at the definition for the sqlos.wait_info Event, the first Predicate criteria specifies that the duration of the wait has to be greater than 15 seconds. 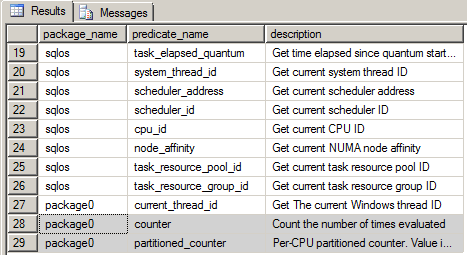 Since the majority of waits in SQL Server generally occur with durations less than 15 seconds, the Predicate evaluations shortcut immediately and the Event does not fire. If the wait exceeds the 15 second duration, the evaluation continues and checks that the wait_type matches one of defined values. How do we know what these values are? When looking at an Event, all of the columns have a type_name associated with them that can be found in the sys.dm_xe_object_columns DMV as previously discussed in this series. 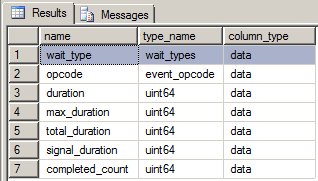 If we take a look at the type_name for the wait_info Event wait_type column, we’ll see that it has a type of wait_types. If you look at the way the Predicate is defined, it is much closer to how you’d write a WHERE clause with complex filtering criteria, allowing groups of specific criteria to be defined within sets of parenthesis’s that are evaluated together, something that was impossible with SQL Trace. In addition to being able to define Predicates based on the Event columns returned by an Event, it is possible to also define Predicates on the global state data available in the Extended Events Engine. If you’ll recall, the global state predicates are available in the sys.dm_xe_objects DMV as pred_source object_type’s. Two of the predicate sources are special, the package0.counter and package0.partitioned_counter, and can be used to restrict the number of occurrences of an Events that are captured by an Event Session. The following demonstration creates an Event Session that captures the first five occurrences of the sqlserver.sql_statement_completed Event, and then executes six statements in sequence. When the target_data is queried the last statement SELECT @@SPID is not included in the results. This capabilities behind Predicate definition in Extended Events makes it much more flexible, and powerful for troubleshooting than SQL Trace. It also makes Extended Events much more performant than Trace by preempting Event firing for Events that are not of interest. An XEvent a Day (24 of 31) – What is the callstack?